Sit down and choose a comfortable seat you can commit to. Focus your attention and steady the mind on one point of concentration. A "comfortable seat" recommended is typically seated on the floor with your legs crossed and your hips elevated by using a cushion or a blanket. Or you may choose to sit in a chair with your back straight and your feet pressed firmly into the ground. Your hands can be resting on your knees or at your side. The idea is to feel comfortable so that you don't fidget too much. One point I would like to stress is the common misconceptions about meditation. Most people tend to think they should make their mind blank and stop all thoughts. That's not the goal. I'm here to tell you, that if you are human, your mind will take charge and the intention is to simply become aware of the thoughts and to observe them. Don't attach yourself to them and if you find you get lost on a certain thought pattern, just return to the breath or to your mantra. The last tip I'll leave you with is that I find the best time to meditate is first thing in the morning or at evening. In our training materials, they say sunrise and sunset, when the night is meeting the day and the day is meeting the night. There were a few other books that were either mentioned during lectures, recommended by fellow yogis or introduced through our required book report presentations. If you are a teacher-in-training or a yoga practitioner looking to deepen your knowledge, I suggest investing in a copy of each. Not only have I enjoyed reading them, but they’ve helped me tremendously throughout the training. Light on Yoga was first introduced to me by one of my bestest friends, Kelly (who you'll be hearing more about on this blog). 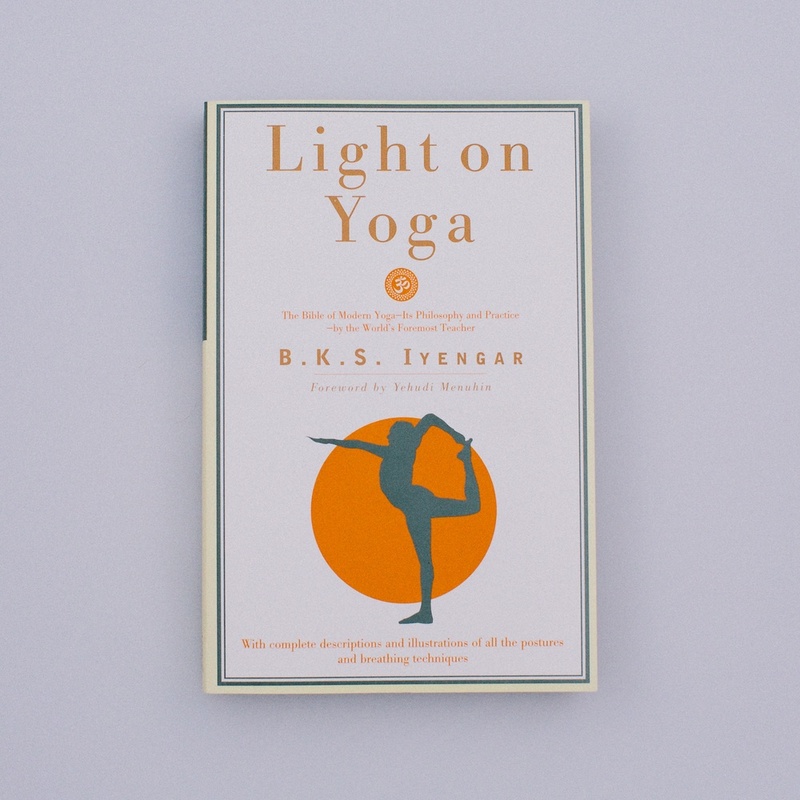 Written by the founder of Iyengar Yoga, B.K.S. Iyengar, this book is referred to as "The Bible of Modern Yoga." It includes more than 600 photographs of various postures and breathing exercises. And my favorite part...it provides the benefits of incorporating them into your practice. Jivamukti Yoga was given to me by my yogi friend, Jessie. When she heard I was considering enrolling in the teacher training, she let me borrow her copy, and then told me to keep it. I'm glad she did because I destroyed it by underlining, highlighting and flagging so many pages. It's a great book that I’ve referenced and read from multiple times during our training. All books can be found in the Words of Wisdom Shop. Believe it or not, we're more than halfway through the 200-hour yoga teacher training. Only three more weekends to go! Although this has been one of the hardest things I think I've ever done -- mentally, spiritually and physically -- I can't imagine my life any other way. Working full time, planning for a wedding (this October!) and making such a large time commitment has had it's challenges, but hey, like they say, "nothing good in life comes easy"...right? One of the things that I don't think I was fully prepared for going into this type of training was the physical demands it would put on my body. Before I started this training, I had a routine in which I worked out four to five times a week doing various activities such as spin, bootcamp, barre class, biking and yoga. But at most, I was doing yoga two times week. I'm here to tell you, that when you do anything repetitively, no matter how "good" it is for you, it will wear you down over time. We start each Saturday and Sunday in the studio with a 65-minute asana practice followed by various physical activities which include practice-teaching, adjustments, inversions, forward bending backward bending and balancing postures. First things, first. HYDRATE. I drink a ton of water throughout the day in my reusable Kleen Kanteen, but when I get home I add a pack of Ultima 8 oz of water and chug! After hydrating, I fill the bath tub full of warm water and add Dr. Teal's Lavender Epsom Salt and SOAK... for at least 20 minutes (I use my iphone and set an alarm). As I'm draining the water out of the tub, I turn the shower on and I EXFOLIATE using these gloves -- this gets rid of dead and dull skin cells keeping your skin looking refreshed. After bath time, I grab the tub of Coconut Oil and MOISTURIZE from head to toe. Slather it on the bottoms of your feet and put socks on for a few hours to lock in the oil. Now fully relaxed, I pop a Magnesium SUPPLEMENT. Here are several articles that talk about the benefits of having enough of this in your life -- muscle recovery, keeping PMS and anxiety at bay and ensuring shut eye are a just a few of the reasons I take it. After that, I put the tea kettle on and make comforting Chamomile TEA and treat myself to some DARK CHOCOLATE. Alter Eco Mint is my absolute favorite. Take these ideas and apply them to your life as needed. You don't need to be preparing for a marathon, doing a yoga teacher training or be an overly active person to benefit from taking time out to treat yourself to a little extra attention every now and then.